Top my 5d are great and with your software it is greater. Out for a while, taking a short break. Tomorrow, my 5Dc will go to its rightful owner, so... probably it's time to post a beta 4. It was compiled from the same code base used for 7D alpha 1, it feels quite solid on my 5Dc (although I didn't shoot anything serious with it, just ran built-in stability tests that simulate random button presses), and it basically contains all the features I could port without significant reverse engineering efforts. That's it - the 5Dc was quite fun to analyze, lots of internals are simpler and can be understood, but... it has some severe limitations. ML code is open, there are both free and paid reverse engineering tools, anyone can look inside and continue to experiment, there are firmware addons for 350D and 400D from where you can learn and borrow features... you only need time, skills and the desire to innovate. I hope this update will effectively turn your 5Dc into a new camera (well... without LiveView). - if a pic ist autorotated, the overlays in playmode doesn't rotate. On-topic: it requires finding the image buffer that's actually being displayed. That, and the fact that altering its contents doesn't reflect on the screen, are hints that what I'm using now it's something else. thank you so much , Alex . This is such a charm ! It works on 5D sn 09307xxxxx. Thank you very much! Canon 5D3,1.1.3 CF-SanDisk Extreme PRO,160MB/s, 256GB, SD-SanDisk Extreme, 90MB/s, 64GB. I want to say thanks as well! I am just upgrading to a 5DII but this hack is still awesome! Here's my test to playback timelapse . i hacked my 5D Classic with the Beta 4 ML and so far so good! intervalometer seems to be working, though i didn't have it running for very long yet. looking forward to using my camera more now! This is only a preview of timelaps from one shoting on wetlplate. I must finish that video. also, try to use M mode and lock the aperture. where is the ramping for the intervalometer like in Beta 2 (or 3?) ? how should i do timelapse without that function? Downgrade to that one instead of complaining. sorry, i dont want to complain. i was only wondering why this function is not included. the other version is not working at my 5d. It's answered in the beta 4 announcement. is there a way to implement a shutter count feature i dont know but if there is a way it were great. have you a facebook account because i would like to see any pictures from you. 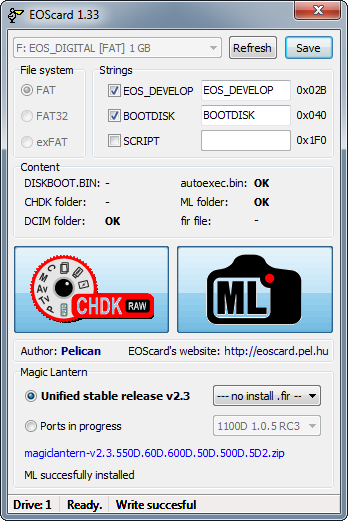 I would like to include 5Dc ML to EOScard options (in 'Ports in progress' section) to automatically install ML to the card.For this I need a permanent link to the ML zip or a permanent link to a text file which contains the actual link to the ML zip. Is this possible to present one of this when you make a new version? Edit: Nevermind, I made it. Ok i have Beta 4 on card. I'll test it today. Hope i test a flash bracketing.